Description: This lovely ground floor apartment has everything you need for a relaxing break in the sun in comfortable surroundings. Located within the Condado de Alhama Golf Resort, the apartment is ideal for golf breaks and holidays, or as a longer rental to fully explore all that the Region of Murcia has to offer. The tastefully decorated and stylish property has comfortable sofas, an open plan living/dining area and a fully equipped galley kitchen. The new apartment has all white goods, including a dishwasher, and the owners have provided everything that you need for a self catering break on the Costa Calída. There is cable TV with channels in a wide variety of languages and plenty of seating. Internet is also available in the apartment, accessed by a code which the owners will supply. But if you would prefer to be in the fresh air, then the flat has a large patio at the front, with loungers and patio furniture, and a small rear patio ideal for eating breakfast in the early morning sun! The main bedroom is beautifully furnished and has a double bed, whilst the second bedroom has twin beds and the remaining room a single bed. The apartment sleeps 5 in comfort. There are fitted aircon units to provide heating and aircon in the summer months. The property has a full bathroom with bath and over-bath shower plus bidet. The owners have provided a gas BBQ for guests to use, and the large front patio is the ideal place to cook and enjoy the views. The flat is situated just near the communal pool, with a safe kiddies pool. The commercial centre is about a 10 minute walk away. Each "Jardin" of the resort has it´s own private swimming pool and a children´s play area. There is a tennis club, café bar, Irish bar and Paella restaurant and a large supermarket now open within the commercial centre, with bars overlooking the lake. The golf course is now maturing nicely and is very close to the apartments. Buggies, trolleys and clubs are available to hire at the pro-shop, and the open driving range and practice putting green make the ideal place to perfect those tricky shots. Condado de Alhama resort opened the first Jack Nicklaus designed course in 2010, and the new course is in great condition.The course is 6059 yards long and a par 72. Fees start at 65 euros for 18 holes, although the twilight fee of only 35 euros makes this course an unbeatable option. Buggy and club hire available. Lessons from 30 euros. Please contact us for more detailed information. The resort has safe cycleways around, and is ideal for young families, due to the secure gated complex and on-site amenities. There is bike hire on the resort for very reasonable rates. 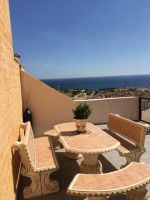 The apartment provides an ideal base to explore the Mazarrón area, and is located around 20 minutes from the beach . The beautiful Sierra Espuña nature reserve is a short drive away, with walking trails, quad biking and cycleways. The bright lights of Murcia city and the retail park at Nueva Condomina are around 30 minutes drive away. A perfect base to rent for a family holiday. And if you have friends in the area, the resort is only 5 minutes drive from the large Camposol urbanisation, or 10 minutes from the Mazarrón Country Club. Pets allowed at the owners discretion, smoking outside the apartment only. Please ask for details for long term lets. Aircon runs by card meter with 10€ credit included per booking. Additional cards may be bought from local management company. This property is legally registered with the Murcia Tourist Board as a vivienda Vacacional ( Holiday Home). This listing has been viewed 14732 times.